I’m sharing this tip, as it took me way too long to find a simple solution online, and as most of my articles, as a reminder of how to do this again in the future. After increasing security on my NodeRED server and certifying the server, I had to learn how to authenticate the HTTP requests with username and password and how to deal with HTTP vs HTTPS requests. I’m submitting my data to the NodeRED server, which is password protected and SSL certified. This means I have to now include the basic authentication (username, password) in my few requests. I have put together a few lines of codes that make it easy for you guys to use, and obvious to read. The code is simple, but if you are using a laptop, consider DNS rather than the IP for the NodeRED server. If you want to know why or what can you do with it, imagine linking a request like this to a keyboard macro. You can use this to trigger lights, events or send notifications to other devices. Because the details of my server have changed, I had to redo all my HTTP requests. I don’t want to do this each time something changes. I figured out that I can set the global variables in EventGhost on start. Let’s do this so should anything happen I can change the values in a single script. This way, if your IP or credentials change you have to modify only a single file. 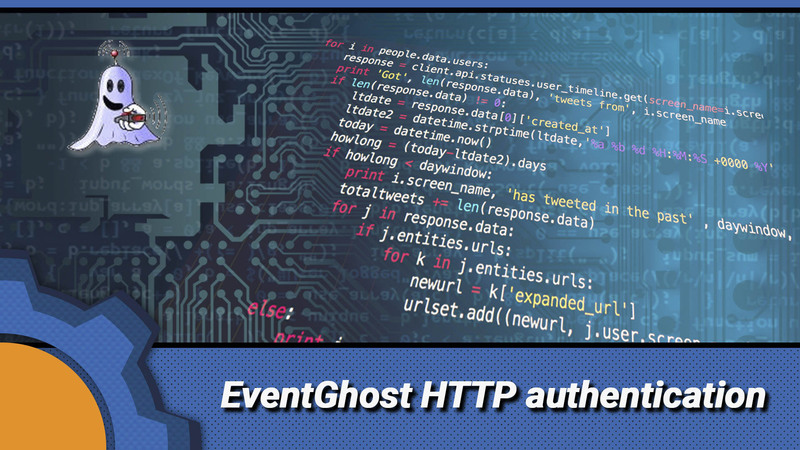 I hope this tip on how EventGhost basic authentication in HTTP requests works will cut the googling time for you. If I can’t find a simple and well-explained answer within 3 pages of google searches it deserves an article. Even if it’s going to be a short one.